Civil Air Patrol (CAP) is a Congressionally chartered, federally supported, non-profit corporation that serves as the official auxiliary of the United States Air Force (USAF). CAP is a volunteer organization with an aviation-minded membership that includes people from all backgrounds, lifestyles, and occupations. It performs three congressionally assigned key missions: emergency services, which includes search and rescue (by air and ground) and disaster relief operations; aerospace education for youth and the general public; and cadet programs for teenage youth. In addition, CAP has recently been tasked with homeland security and courier service missions. Civil Air Patrol was created on December 1, 1941 by Administrative Order 9, issued by Fiorello H. LaGuardia in his capacity as Director of the Office of Civilian Defense with Army Air Corps Major General John F. Curry as the first National Commander. During World War II, CAP was seen as a way to use America’s civilian aviation resources to aid the war effort instead of grounding them. The organization assumed many missions including anti-submarine patrol and warfare, border patrols, and courier services. CAP pilots sighted 173 enemy U-boats and even sank two. After the end of World War II, CAP became the civilian auxiliary of the United States Air Force, and its incorporating charter declared that it would never again be involved in direct combat activities, but would be of a benevolent nature. CAP changed command several times, to Continental Air Command in 1959, Headquarters Command, USAF in 1968, and Education Command, Air University in 1976. Since its incorporation charter, CAP has maintained its relationship with the USAF, and has continued its three congressionally-mandated missions. Membership in today’s CAP consists of cadets ranging from 12 to 21 years of age, and senior members 18 years of age and up. These two groups each have the opportunity to participate in a wide variety of pursuits; the Cadet program contributes to the development of the former group with a structured syllabus and an organization based upon United States Air Force ranks and pay grades, while the older members serve as instructors, supervisors, and operators. All members wear uniforms while performing their duties. 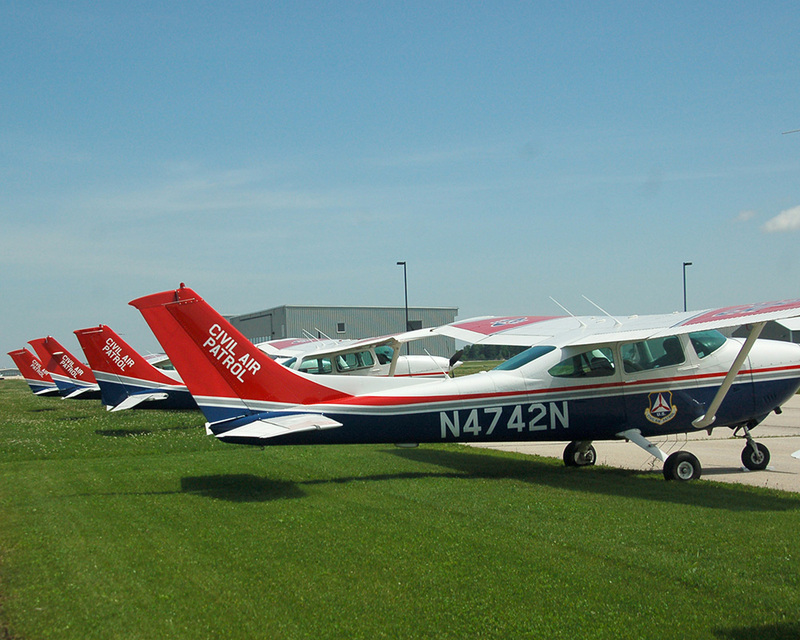 Nationwide, CAP is a major operator of single-engine general aviation aircraft, used in the execution of its various missions, including orientation flights for cadets and the provision of significant emergency services capabilities. Because of these extensive flying opportunities, many CAP members become licensed pilots. The hierarchical and quasi-military organization is headed by the National Headquarters (with authority over the national organization) followed by eight regional commands and 52 wings (each of the 50 states plus Washington, D.C. and Puerto Rico). Wisconsin Wing supervises the individual groups and squadrons that comprise the units within our state, including the Fox Cities Composite Squadron.